Research has revealed that Markle has her own extraordinary list of royal descendants dating back hundreds of years. Meghan Markle smiles during a visit to the Eikon Exhibition Centre in Lisburn, Northern Ireland on March 23, 2018. On May 19, Meghan Markle will officially become a member of the British Royal Family in a wedding ceremony that will be broadcast and celebrated around the world. Ahead of the big event, research has revealed that Markle has her own extraordinary list of royal descendants dating back hundreds of years. Ancestry's expert team of family historians have unearthed a calligraphic chart that shows that one of Meghan's ancestors was ­Lionel of Clarence, who was the third son of King Edward III — King of England and Lord of Ireland from January 1327 until his death. Another notable connection that underlines Meghan's royal credentials is Jane Seymour, Queen of England from 1536 to 1537 as the third, and favourite, wife of King Henry VIII. Jane was a second cousin to Isabel Hildyard, Meghan's 12th great grandmother. For every connection to royalty in Markle's past, there is a story of hardship and tragedy. 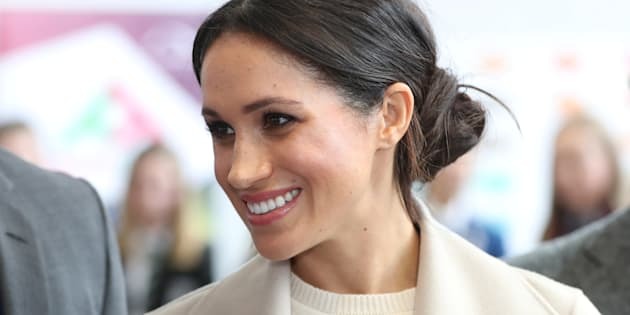 These royal connections will no doubt aid her transition from Hollywood actress to rumoured new title, the Duchess of Sussex. One of the things I love most about family history research is that it can unearth such a diverse range of stories and experiences about our ancestors. For example, for every connection to royalty in Markle's past, there is a story of hardship and tragedy. Megan Markle's fourth great grandmother on her mother's side, Nancy Bowers, was born into slavery. Meghan's fourth great grandmother on her maternal side, Nancy Bowers, was born into slavery in Georgia in the 1820s. Census records reveal that she gave birth to 25 children throughout her life, though tragically only seven survived past childhood. Markle's third great grandparents, Thomas and Mary Ann Sykes, moved to America in the late 1860s where Thomas began back-breaking work in the coal mines of the Anthracite (coal-mining) region of Pennsylvania, and died of a heart attack in the mines just eight years later, leaving his wife Mary Ann a young widow with five children. It's impossible to imagine what these ancestors would have thought of the future that lay ahead for their descendant. Many Canadians might also have British royalty in their veins. They just need to know where to look for it. Unbeknownst to them, many Canadians might also have British royalty in their veins. They just need to know where to look for it. So how do you start the search? It can be a bit of a needle in a haystack situation, but it is possible. Many who have discovered a royal connection did so accidentally. Others had heard of rumoured connections though family lore and legend and simply needed to prove that connection using historical records. Prince Harry and Meghan Markle in the Sunken Gardens at Kensington Palace following the announcement of their engagement on Nov. 27, 2017 in London, England. Cross-reference surnames in your family tree with those commonly found in the British Royal Family. Look for names like Windsor, Stuart, Plantagenet. Ancestry's Royal Collections has a wealth of information on names that can be explored. Look for evidence of wealthy ancestors through domestic staff listings on census records, property and businesses documented in wills and probate records, and ancestors who were extensive travellers listed in immigration records travelling in first class. Titles like "sir," "count" or "duke" mean your ancestors had some connection to British royalty, familial or otherwise. If any of your ancestors had titles, explore the age and origins of those titles. For surnames in your family tree that are also the name of a place — for example, a town or parish — do further research to establish any connection between that ancestor and significant ownership in that location. Investigate whether any of the surnames in your family tree has Norman origins and if so, research that particular branch of the family as far back as you can, as many early Normans had direct royal connections. If you are one of the lucky ones to be celebrating the royal wedding as an actual distant relative, then my hearty congratulations to you on this family occasion! As for me, I'll be brewing a large pot of tea and enjoying the historical significance and sheer spectacle of the event.